Union line on March 21. Location. 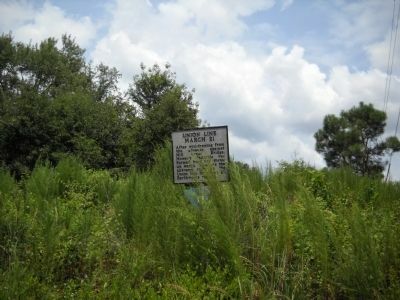 35° 20.492′ N, 78° 16.59′ W. Marker is near Four Oaks, North Carolina, in Johnston County. Marker is on Scout Road (Local Route 1199), on the left when traveling east. Touch for map. Marker is located on the Bentonville Battlefield. Marker is in this post office area: Four Oaks NC 27524, United States of America. Touch for directions. 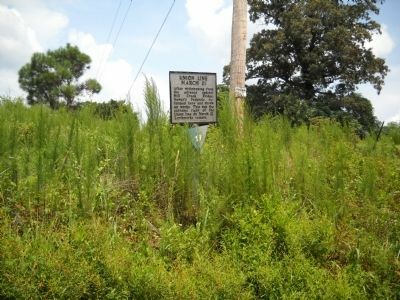 This is marker # 19 along the Bentonville Battlefield Driving Tour. (approx. one mile away); Johnston’s Headquarters (approx. one mile away); Hardee’s Counterattack (approx. one mile away). Touch for a list and map of all markers in Four Oaks. More. 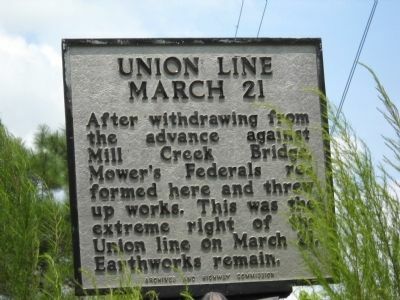 Search the internet for Union Line, March 21. Credits. This page was last revised on April 4, 2017. This page originally submitted on August 21, 2010, by Bill Coughlin of North Arlington, New Jersey. This page has been viewed 532 times since then and 3 times this year. Photos: 1, 2, 3. submitted on August 21, 2010, by Bill Coughlin of North Arlington, New Jersey.